Life is often chance. I actually started my sojourn on a whim. My wife and I had lunched at the outstanding L’Atelier de Joël Robuchon restaurant in Covent Garden. We decided to split up for the afternoon – me to go for a walk of discovery, she to do a bit of London shopping. I’d initially thought to go down Whitehall, via Parliament Square and into St. Margaret’s Westminster, the church of my marriage 41 years ago. Last time I was there, the building was closed for renovation. 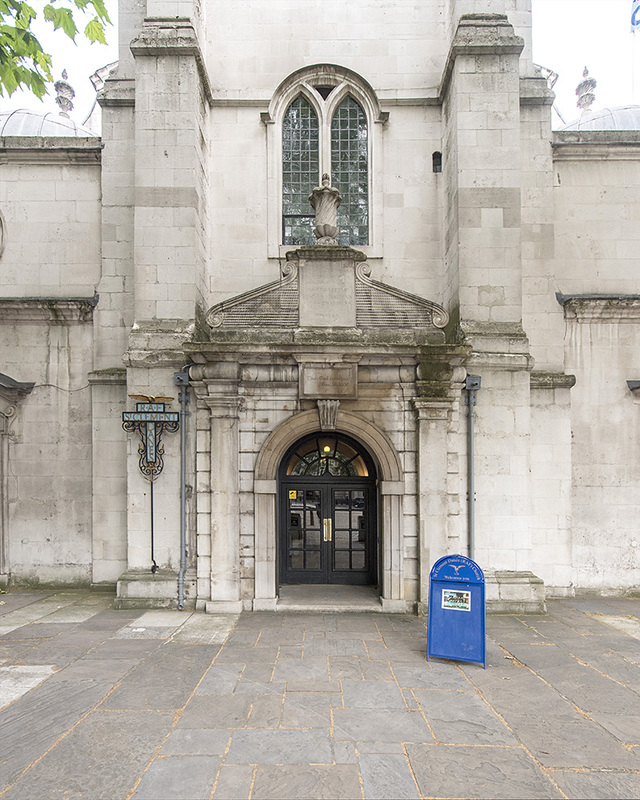 A close friend, Bernard Graves, a recent Australian visitor to London, had posted a picture of St. Clement Danes Church on the Strand the previous week. 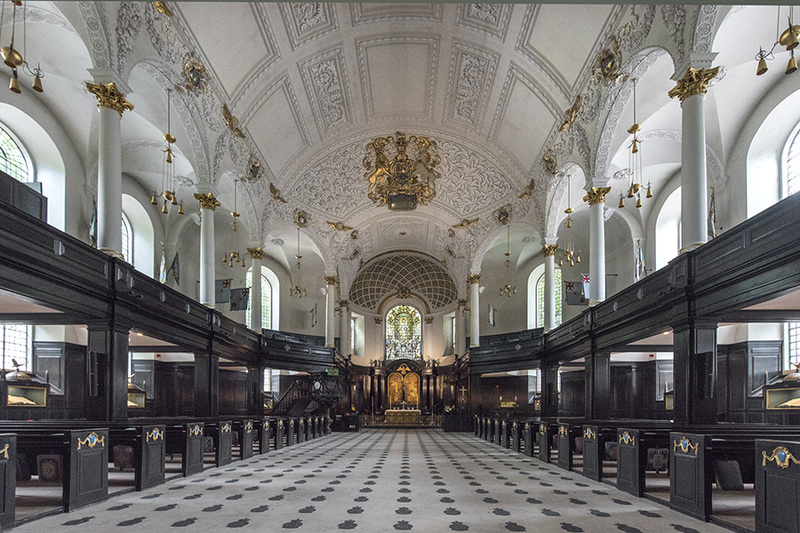 A keen historian, Bernard had noted in his message news of the wonderful restoration of the church of St. Clement Danes, spearheaded by Britain’s RAF. He spiked my interest to investigate further. I thought of Bernard’s story about St. Clement Danes. “Well if I can walk as far as St. Paul’s Cathedral, and take in St. Clement Danes in passing, I can actually see 3 Wren buildings in two days.” For the next day I had planned a visit to Greenwich, with my longest-standing friend from pre-school days when we were six. Wren designed the Royal Observatory at Greenwich, as well as St. Paul’s. I grew up in London. I was born in Hampstead. That’s six decades ago now. Bow Bells was clearly audible from the slopes of Parliament Hill Fields below Hampstead Heath. Technically, therefore, that makes me a cockney. (You can only be a cockney if you were born within earshot of the famous Bow bells.) I thought I knew London’s churches. By the end of the day I had learned a great deal that I didn’t know at all or had completely mixed up for years. From Soho, I started down to Trafalgar Square and looked in on St. Martin-In-The-Fields. This isn’t a Wren building. It’s by a student and admirer of Wren’s. It was the result of a competition held by the Commission for Building Fifty churches in London, that was established after so many were lost after the great fire of 1666. Wren was a key member of the Commission panel, along with Sir John Vanburgh. 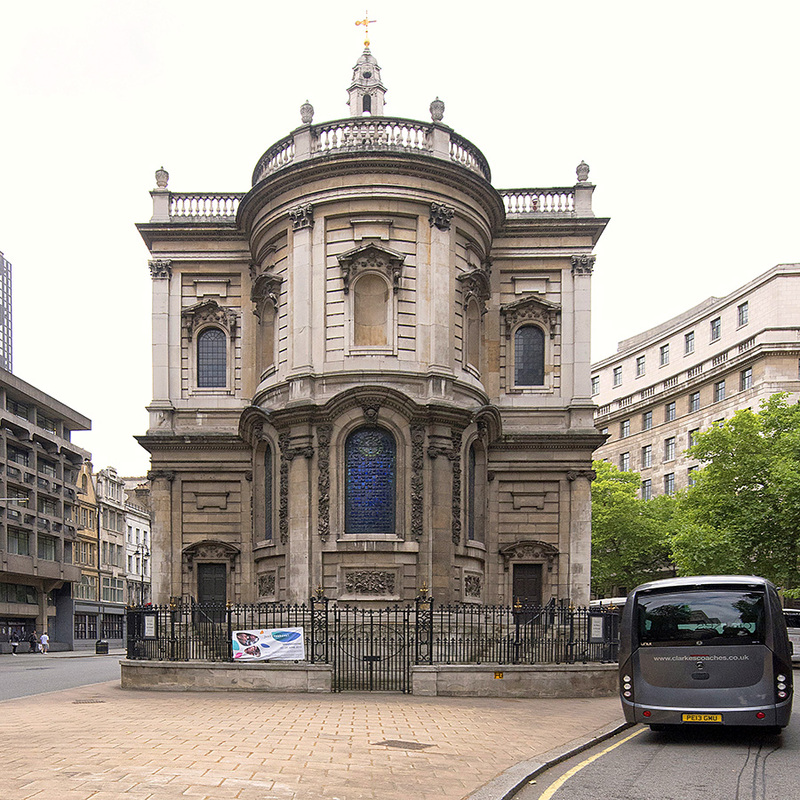 The successful bidding architect was James Gibbs for the site at St. Martins. The building we see now was finished in 1724. It differs significantly from the original design submitted by Gibbs. In fact the revised design that was built became the model for a large number of subsequent American churches, with its until-then-unprecedented placement of the spire above the naive, anchored to the west wall, nearly mid-building when allowing for the portico. 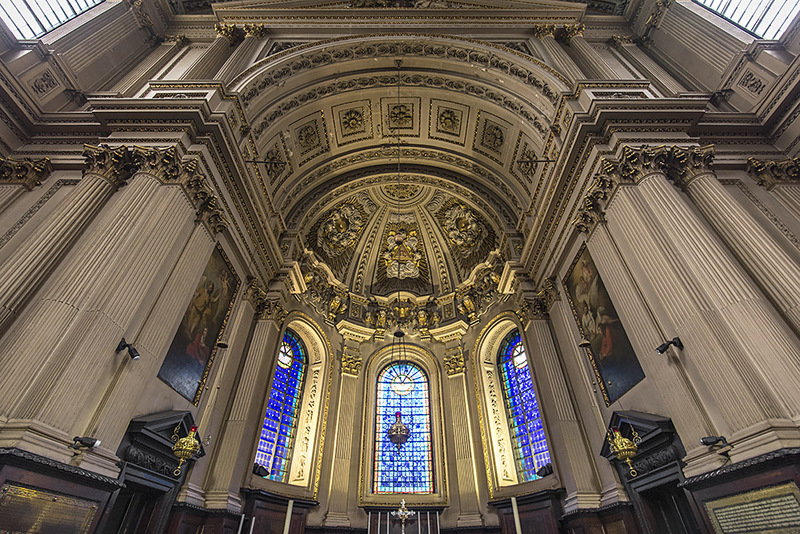 Today St. Martins hosts weekly concerts, offers daily services for central London and its millions of visitors. It’s a place of rest on its extensive steps and portico entrance to many a weary traveller, exhausted by the neighbouring crowds of The National Gallery and National Portrait Gallery, or people who have traversed Trafalgar Square and viewed Nelson’s famous Column. The external picture above, taken in 2012, was taken after a big afternoon rain system had cleared to the East, allowing the late afternoon October sun, setting in the West, to light it so brilliantly against the dark clouds behind it. St. Martin-In-The Fields (-the Church) does not, contrary to popular opinion, host The Academy of St. Martin-in-The-Fields, the fine orchestra founded by Sir Neville Marriner. The Academy is a scratch orchestra formed from members of many of London’s five orchestras and many more ensembles, primarily for recording purposes. It made the Decca Record Company a lot of money and made Mariner a highly sought-after conductor. Alas No! – My memory has forgotten there are two ‘island’ churches on this stretch of road. 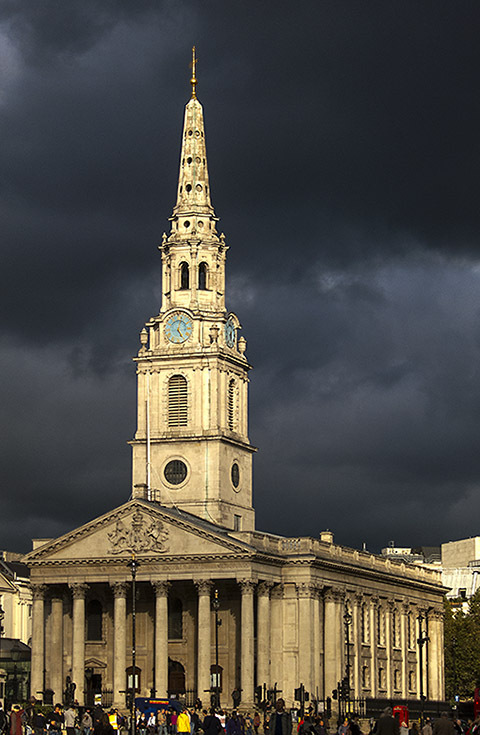 This one is the church of St. Mary le Strand. As I enter I get a small taste of the impending detail about to greet me inside. The ceiling of the portico is magnificent. But you have to look up, before you enter! This was the first public building in London that architect James Gibbs, who had studied in Italy, designed. As a committee member Christopher Wren provided guidance to the young Gibbs. It was completed in 1717, but not consecrated until 1723. It stands on grounds that contain traces of buildings back to Roman times, as well as Saxon and mediaeval London. Just nearby is Somerset House, home to ancestral records of many an Australian family. The building survived the Blitz in World War 2, and has been progressively restored over the past fifty years. The interior mouldings of the ceiling (executed by John and Chrysostom Wilkins) are remarkable, as is the apse and dome above the altar. 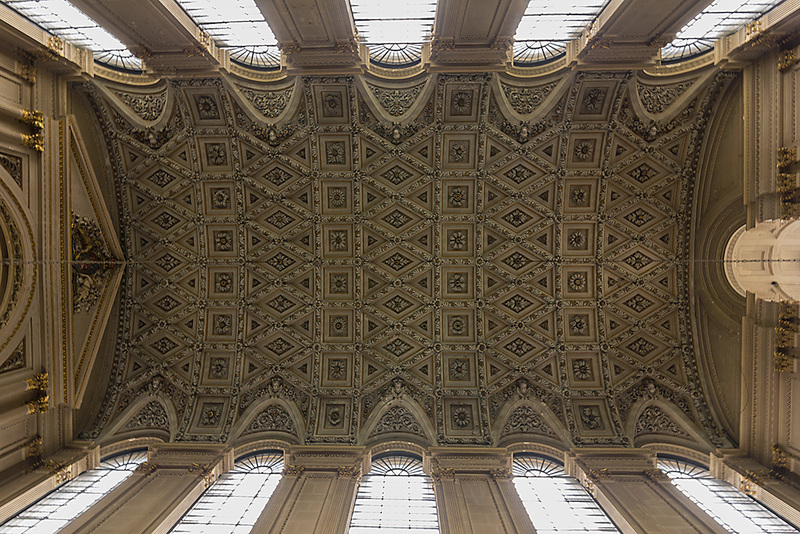 Like so many great buildings, the interior ceiling is where some of the most impressive work is shown. 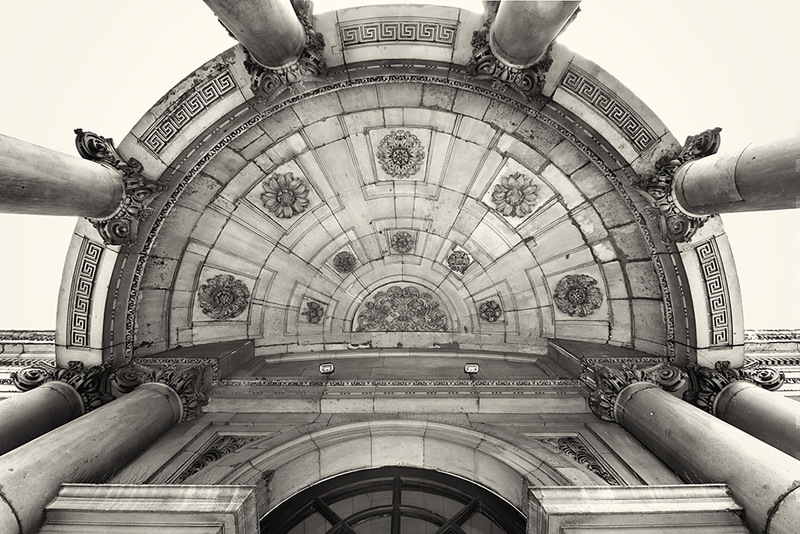 The photo below shows the intricate mouldings involved. I encounter Michael who is discussing organ seminars with the other visitor that afternoon. I later learn he is the Verger. When he becomes available he freely details much of the restoration process and the workings of the current diocese. In younger days I was a very involved Anglican. Sadly the institution of the organised church in Sydney has kept me away in recent years. But churches and church music still inspire. It’s time to move on. That took an unscheduled hour and some informative discussions with Verger Michael Tiley, who had a boundless head for historic facts and liturgical context. But for added pleasure read what former Poet Laureate, Sir John Betjeman had to say about Gibbs and St. Mary le Strand. As I progress eastwards I pass the Australian High Commission. I once voted there when I found myself in London at Australian General Election time. It’s off to another island church, located on another narrow triangle of land between the Aldwych and The Eastern part of The Strand. It’s St. Clement Danes, now the official church of The Royal Airforce. This is a Wren Church. It dates from 1682. In fact Gibbs, the St. Mary’s architect, made some added contributions to St. Clement Danes in 1724 as completion of St. Martins was at its end.. It has been magnificently restored. It’s much lighter and brighter than most with clean white paint throughout the upper naive ceiling. It has formidable, intricate mouldings and fine large plain glass windows to add to the sense of light. The pews are marked with famous names of past heroes, including Bader and Cheshire, and Air Marshals Harris and Dowding, famed through their World War 2 achievements and whose statues are outside the church. Many associated wartime airforces are remembered. Foreign airmen from Australia, New Zealand, Poland and Czechoslovakia are included. As I read through the names I am reminded of the late Jaroslav (Jan) Novak, a Czech airman who made Australia home, and worked as a keen member of the Photo Industry in Newcastle, NSW. He flew for the RAF, defending freedom. His book Let’s Add a Little Oil to the Fire can be purchased from Amazon. Man more passionate for good over evil has never walked this earth. As one turns around one sees the magnificent organ, a donation by the US Air Force. The restoration quality reminds one that precision craftsmen over hundreds of years, in Britain and much of Western Europe, have been the people to whom we owe so much for the visual built-environment heritage we now enjoy. Here is a church that was all but destroyed in the Blitz. 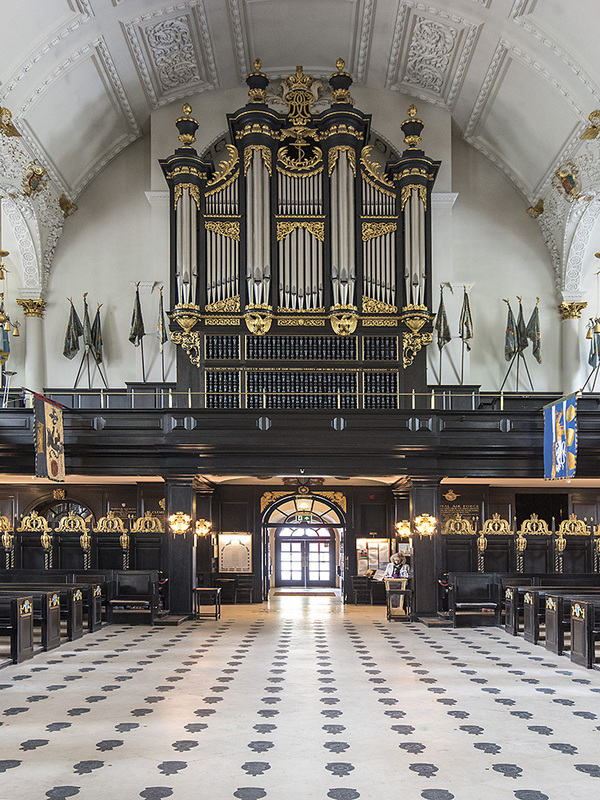 Through dedication it’s now restored and a vibrant place of worship, with regular lunchtime concerts, serving the City of London and the Airforce as a key part of community. I said at the beginning of this piece that life is often chance. As I later researched some of the history of this fine building, I also learned that the organist from 1957-1992 was the same person who had served at my local Parish Church, St. John at Hampstead, over the same period: Martindale Sidwell. He developed a wonderful choral tradition at both churches, performing regularly at The Royal Festival Hall with augmented choirs. He, along with my father, instilled in me my love of Bach and fine music. In all these years I somehow never knew or had forgotten that Sidwell had served concurrently at both churches. The life of a musician is seldom one of wealth, so multiple roles were no doubt mandatory. All text and pictures are Copyright John Swainston, 2012, 2015. All rights reserved. Thank you for ‘that walk down memory lane!’ I doubt I’m fit enough these days to walk the lanes and by-ways but your blog has brought many sights (and sounds) back to the front of my mind.